Birmingham-based Revelator opened its airy upper King Street storefront last November, adding to the peninsula’s coffee shop blend. 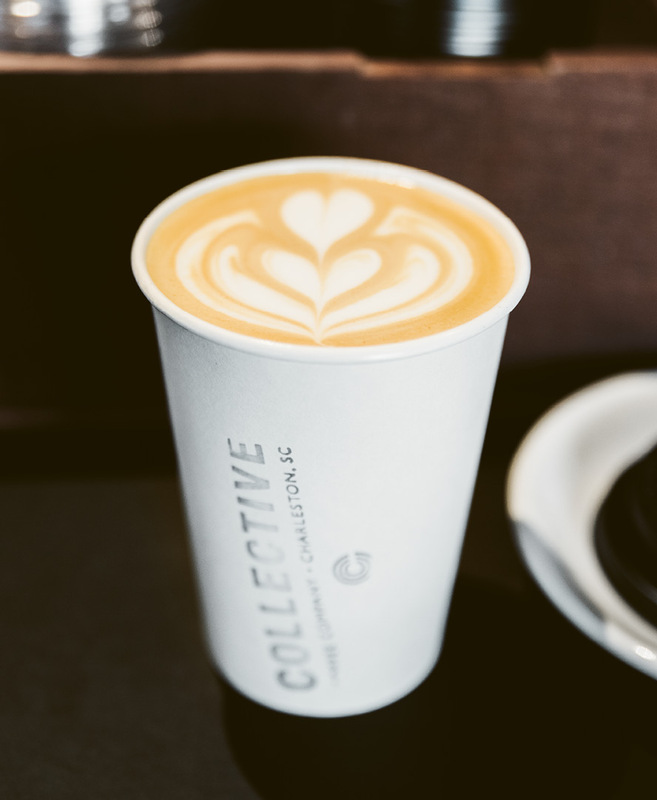 Coffee Complements: An ever-present conversational din and friendly counter service warm up the art gallery vibe at Collective Coffee Co. Hot in the City: Students and professionals alike flock to Kudu Coffee for strong java, iced coffee, and latte art. Many know this cozy café as a can’t-miss stop for over-the-top treats in the French Quarter, but the coffee indulgences are also spot-on. Featuring a little library and lounge area, this place provides the perfect afternoon pick-me-up. If the fresh bread aromas don’t draw you up on the porch of this Charleston single, the elevated coffee flavors should. A solid rotation of college students, downtown professionals, and restaurant staffers make their way through the warm shop, grabbing from-scratch pastries and breads as well as lattes dressed with interesting homemade syrups like coconut and blackberry. Superb coffee and sweet works of pastry art lure Francophiles, CofC faculty, and pedestrians into this quaint French crêperie, which boasts ample sidewalk seating à la Paris. With dark wood-paneled walls chock full of original works, jars, tins, and other worldly wares, this Market Street staple has an artsy vibe that’s as brooding as the clientele. Duck into the snug coffeehouse for close conversation or just some one-on-one with a good book. With a polished parlor feel that harkens back to salon society, this French Quarter gem puts forth a notable afternoon tea as well as after-dark delicacies. The walk-up coffee window may be most appreciated by harried parents scrambling for a jump start as they head into the neighboring Children’s Museum, while the interior’s lodge-like appeal has coffee connoisseurs pulling up barstools for espresso-spiked mocktails or simple mugs of delicious brew sweetened with house-made cashew pepita milk. 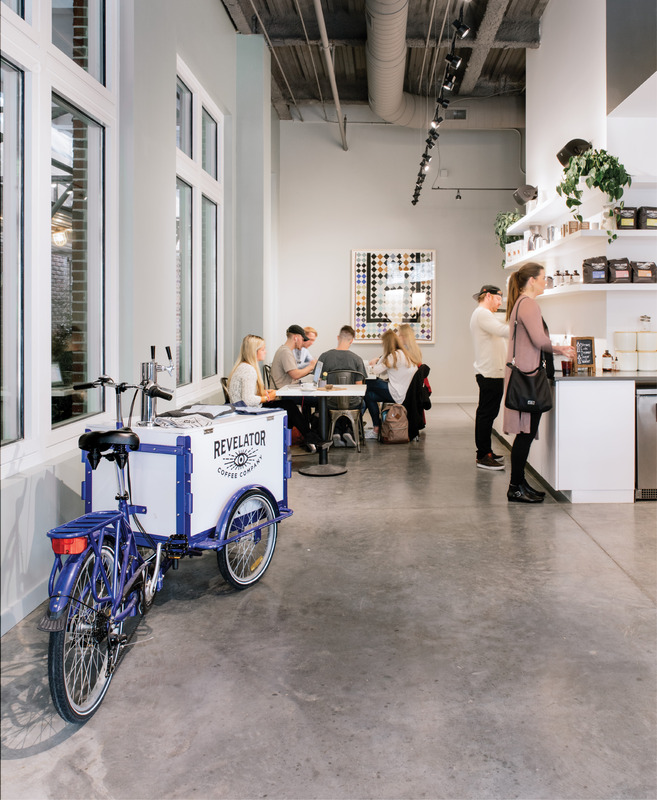 The monochromatic décor speaks to the clean offerings at this plant-pushing hot spot, and the coffee concoctions, made with milks like soy, almond, hemp, and coconut, are no exception. When dusk falls, tap into your dark side at this pub-style nook across from the City Market. The elevated classic desserts certainly warrant sinful indulgence, but so do the liquored-up coffee concoctions. In this former factory-turned-gourmet food hall, pull up to the chef’s counter and discover why this hot spot’s creative coffee manager, Michael Ma, has gotten much buzz. Thanks to an overflow of green coffee beans pouring into Charleston, this bakery cooks up more than breads and pastries. 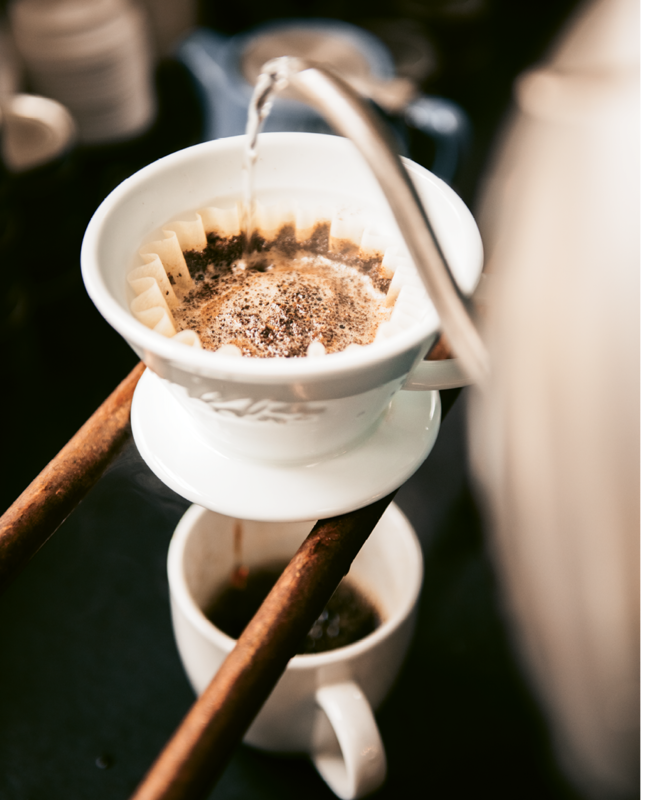 At both the South Windermere roastery and the Broad Street storefront, patrons can partake in interesting daily roasts. Sky-high windows and floating shelves neatly stocked with smart home brewing paraphernalia are the only wall décor in this spare, cool newcomer to the Upper King java scene. Settle into mid-century club chairs with Relevator’s caffeinated “cocktail” or a more traditional cup au lait with one of the house-made syrups. Weekend mornings, a line of Airbnb visitors and scruffy undergrads spills out the double screen doors of this 275-square-foot shop, named for the jolly barbate baristas behind the polished wooden coffee bar. Inside seating is at a premium, so plan to either grab and go or snag one of the sidewalk tables. Be they on-trend Gen Xers or jovial F&Bers, regulars harbor loyalties as strong as the coffee at this bustling warehouse mini market. 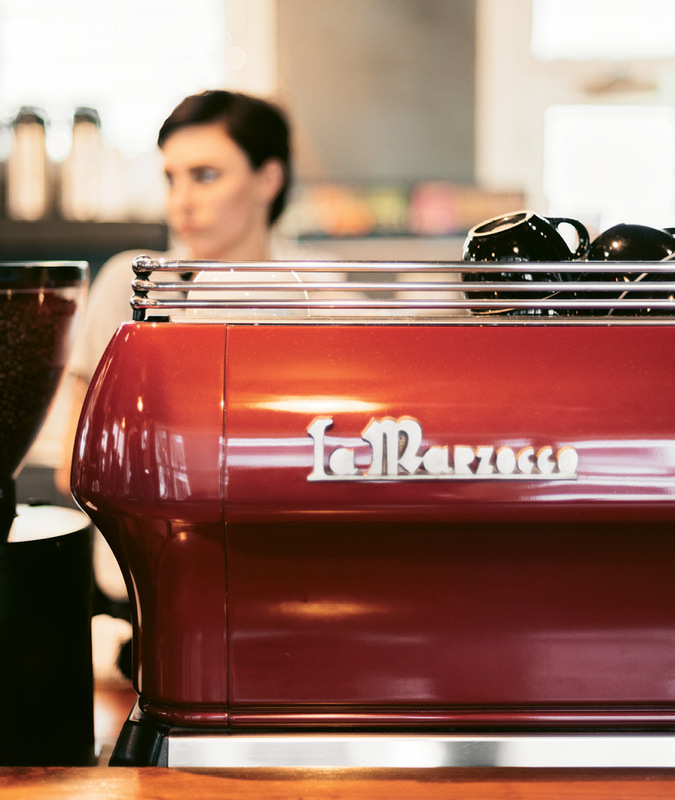 Help yourself to a fresh cup of drip coffee or challenge the barista behind the marble counter to pull a perfect espresso shot on the sky-blue La Marzocco—guaranteed between 23 and 28 seconds. 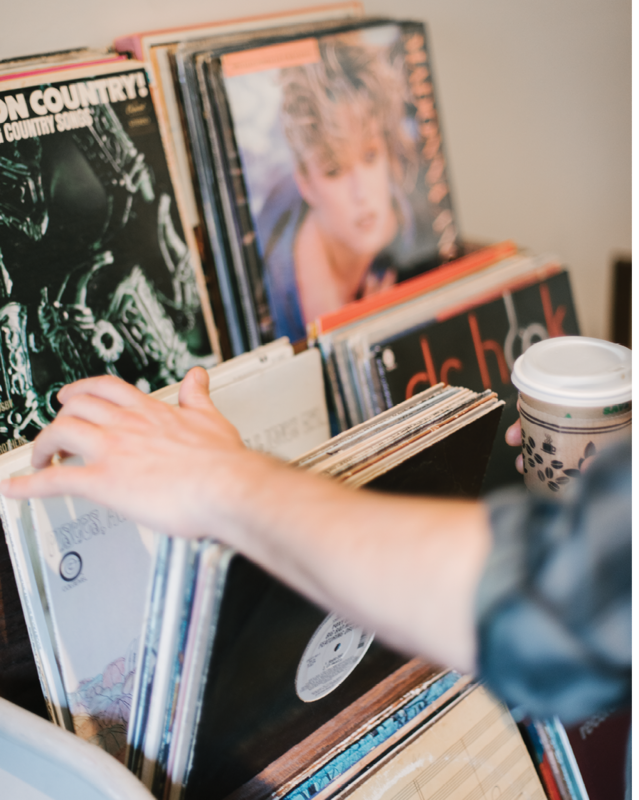 This aptly named emporium has set its sights on collecting—everything from the records stacked in sale bins to a diverse community of musicians, business folk, under-30-somethings, and those who still wish they were. Even the furniture is a mix of needlepoint chairs and occasional tables that look borrowed from Grandma’s parlor (be sure to use a coaster!). 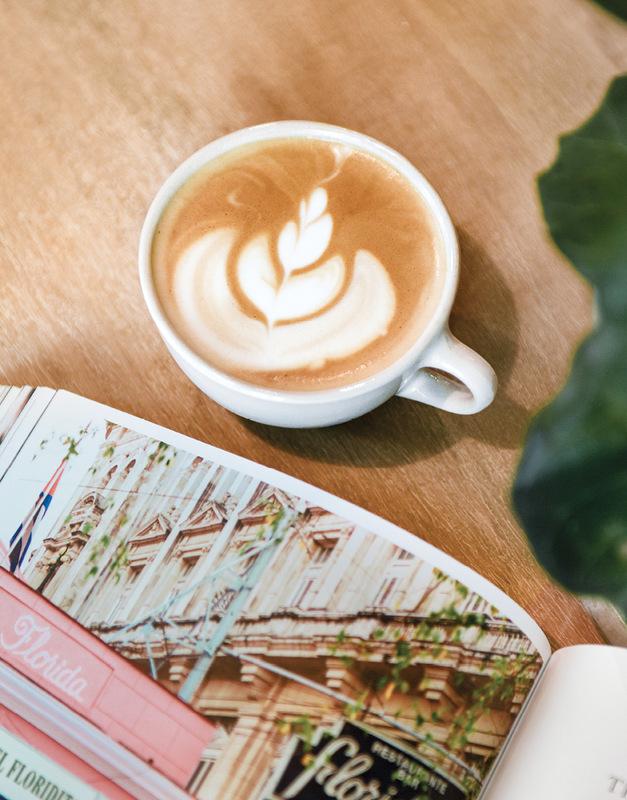 A pristine quick-stop shop frequented by guests of its parent hotel, The Restoration, this European-style coffee bar also provides the perfect hub to stock up on caffeinated provisions before King Street strolling. Undergrads flock to this quirky, dino-themed nook, situated at the heart of the College of Charleston; almost every patron seated along the window bar is plugged into iPods, laptops, books, and high-scoring coffee. 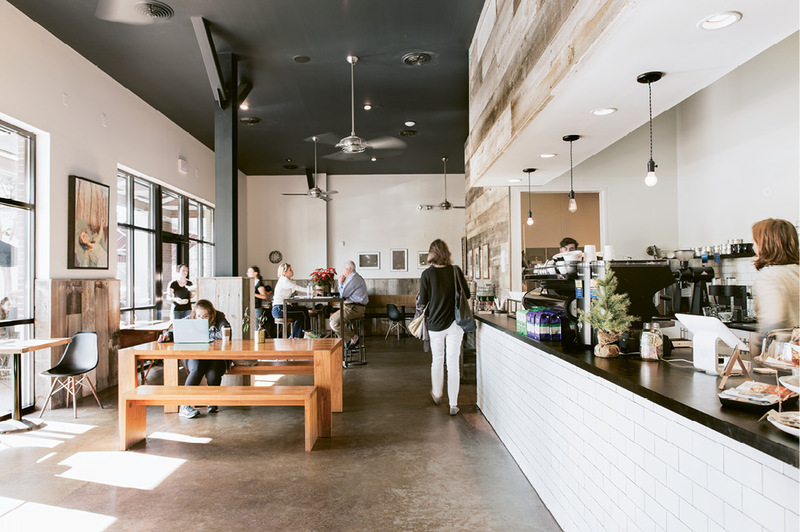 While the newest resident of the former Café Paradiso space that’s nestled beside the French Quarter Inn is airy and sparse—a contemporary scene that alludes to a more local flavor—its location on South Market definitely drives caffeine-craving come-yahs through the doors. From the windowed storefront to the peppy music selection, this hot spot boasts a sunny personality that draws in a vibrant crowd of juicers and java junkies. If you want to try the Dirty Chai, be sure to ask for Nick. Seats here are limited, but charming window benches make perfect perches for watching passersby while enjoying a steaming coffee. There’s also a fresh West Ashley location for those just over the river. This cozy Avondale nook roasts a range of light to dark blends in-house, as well as a daily barista’s choice single origin. 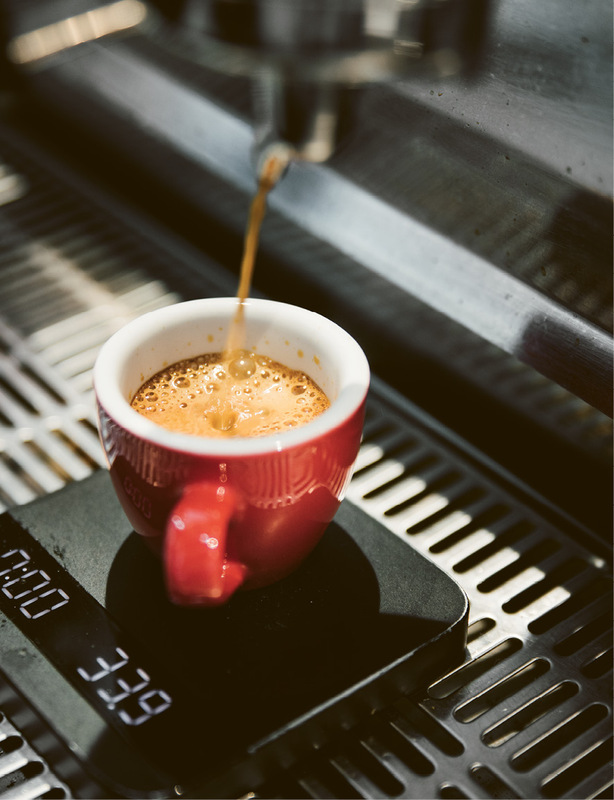 They also take their espresso seriously, using a custom, seven-bean blend. Snag a smooth cup and locally made pastry for chilling on the tree-shaded patio. Order: A basic drip is the most popular cuppa at this no-frills spot. Comfy and welcoming despite its strip-mall environs, this Northbridge Plaza fixture boasts expertly brewed java, fresh baked goods, and perfectly hospitable owners who greet by name many of its regulars (bikers, hipsters, politicians, and business types). Order: The Zippy Bean, a peppy espresso frappe with house-made spicy chocolate and whip—add a vodka shot if you’re feeling saucy. At this happy hippie sanctuary, the patrons are as colorful as the corner cottage. Chill on the sail-shaded patio with a smooth espresso, a rainbow of fresh food choices, and a cheery vibe that’s unequivocally Folly. A James Island location is also brewing. 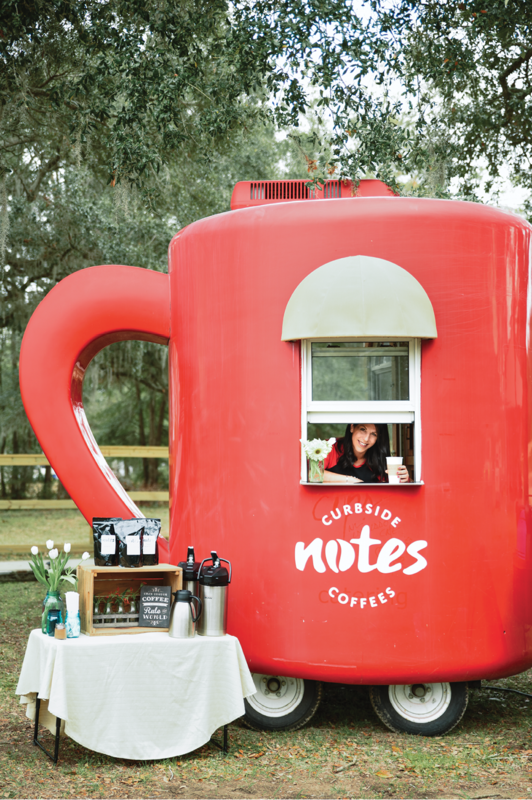 Warm up with an expertly brewed cup in this quirky, artsy, snug little coffee bar and gift shop situated near the intersection of Folly Road and Maybank. The quiet atmosphere is perfectly conducive to cozying up with a good read and a popular honey-lavender latte. Kiawah, Seabrook, and John’s islanders regularly gather at this take-your-time Freshfields Village shop for book clubs and bridge groups or alfresco relaxing. Skip the gas-station coffee and fill up at this green-roofed junction just off the intersection of Maybank and River Road. Delicious drip coffee, chocolate-covered espresso beans, and friendly staff hellos are among the pleasantries being passed out the drive-through window. 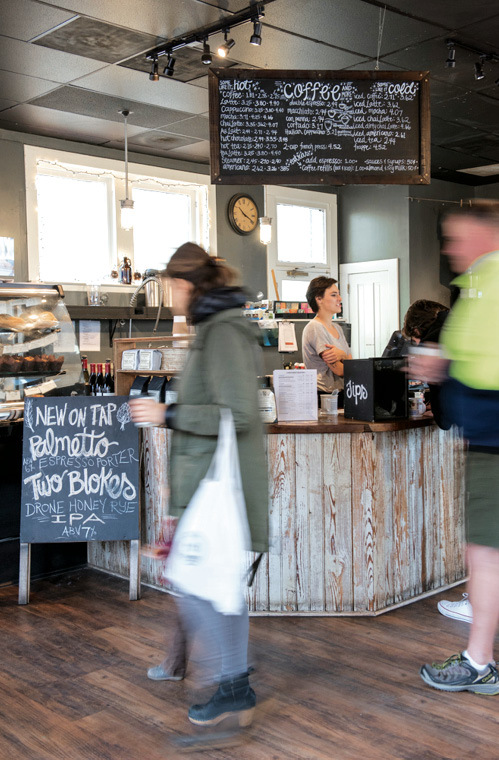 Thanks to its primo brew and full breakfast and lunch menus, this hip stop in the Shelmore Village Shopping Center has become essential to many locals’ morning routines. High ceilings and vibrant orange walls lend a spacious sensibility to this petite shop, where professionals and retirees frequently fill a smattering of tables. When the weather’s nice, the oak-canopied deck provides a delicious alfresco retreat. And for those too busy for a slow cuppa, a drive-thru window allows for fueling on the fly. Stop by this slip of a space in the Old Village recently opened by Italian-born Rudi Barbieri for authentic espresso or the daily brew. Stay and sip if you can grab a table then shop for Italian wines and nosh on cheese and salumi. A happy destination for bite-size pâtisseries, this relaxed Parisian-style shop invites guests to suspend their daily rush in favor of gathering, visiting, and nibbling. Moms often congregate for the popular mocha lattes crafted with house-made chocolate, while littles are treated to complimentary cups of hot cocoa. The colorful crêperie draws many young families in to enjoy its juices, smoothies, and sandwiches, but the expertly pulled espresso drinks also give a nod to the talent behind the counter. Residents of North Mount Pleasant are glowing about this energetic storefront in the corner plaza at highways 41 and 17. Drawn by the promise of good java, businesspeople and teens also appreciate the ample seating and host of outlets inside the retro-rustic setting. With its wide front porch, quaint brick patio, and backyard play area, this charming white cottage beckons guests to sip and stay a while. The shop is almost always buzzing with mommas in need of caffeine and conversation, work-from-anywhere laptop surfers, and local business folk seeking solace from the office. 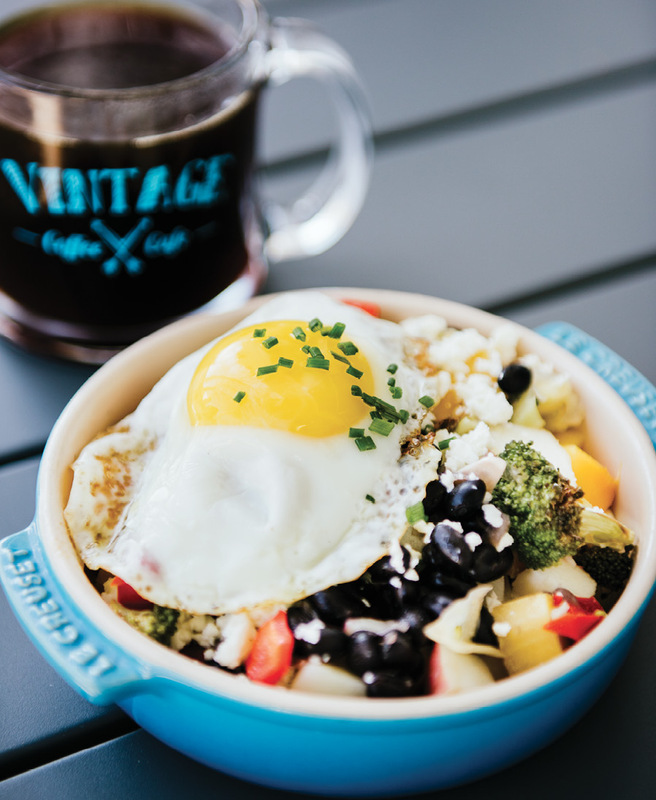 When the temperatures leap above 65 degrees, this seasonal café situated in front of Coconut Joe’s heats up, slinging iced and frozen coffee drinks that hit the sweet spot for tourists and Front Beach-goers. This cheerful shop, stowed below Sullivan’s favorite The Obstinate Daughter, delivers after-dinner treats for diners, as well as afternoon delights for those willing to spoil their dinners with worthy sweets. Does salt air embolden espresso? It seems so at this rustically upscale grab-and-grocery at the far end of Sullivan’s commercial row. Settle into the shop’s large open window bar or carry a cup down to the beach for sipping on the sand. Inside this modern farmhouse-style café, aromas of just-baked gourmet bagels hang in the air. With plenty of seating and honor-system joe refills, this buzzy spot has become a relaxed pit stop for locals and island workers throughout the morning. In a hurry? Order ahead and use the express lane. The basement-style market offers a handful of butcher-block tables and weekend staples like beer, handmade pasta, artisan frozen treats, and of course, delicious java. Order: A drip with house-made syrup—find regulars like vanilla and pecan alongside perkier options such as cardamom and hot pepper. Tucked into a four-room cinderblock cottage just off Park Circle’s main drag, this humble shop extends to neighborhood folk a cozy, welcome-home feel. Order at the kitchen’s Dutch door, and then settle into a leather armchair or the cushioned back bench to read the paper or type away at your laptop. When you catch ’em: Brave the spicy Mexican Fox Mocha. When you catch ’em: Branch out with a turmeric vanilla bean latte. When you catch ’em: Try not to laugh when you order a Got CinnaBuns latte.